[From the publisher:] In recent years, thousands of Australians from all walks of life have been moved to act in support of asylum seekers and refugees and against the Australian government's immigration policy and practice. In Acting from the Heart, over 50 people who reflect the diversity of this movement describe how and why they became involved. The contributors shared a sense of disbelief and outrage that 'Australian values' suddenly appeared to include callous self-interest and a disregard for human suffering. The detention of over 4000 children could not easily be seen as necessary or 'a fair go'. The experiences described in this collection speak to the profound emotional impact of involvement in this movement. Advocates have undergone extremes of sadness, anger, frustration and joy. There is sadness at the loss of Australia's moral innocence and of identity; anger about the pain and damage inflicted on vulnerable individuals; and the frustration of dealing with a political and bureaucratic machine intent on detention at all costs, and operating within a punitive model where all are guilty. And, occasionally, all this is leavened with the joy of a detainee being released. About the publication Sarah Mares and Louise Newman (eds), Acting From the Heart (2007): This book is now out of print, and we no longer supply it to our members or to the wider public. We suggest you could search for online second-hand bookshops to secure your copy. For some, the 'refugee issue' has become a defining personal stance, one which has engaged and divided families and communities. Acting from the Heart shows the hardship and commitment behind this extensive grassroots political movement. Stories, poems and political cartoons by Australia's foremost, award-winning cartoonists, make up this powerful and provocative book. Dr Louise Newman is Professor of Perinatal and Infant Psychiatry, University of Newcastle, and former Director of the NSW Institute of Psychiatry. Her area of expertise is infancy and early childhood development. She has provided consultation to the Family Court of Australia and the Children's Court on child protection matters and is Convenor of the Alliance of Health Professionals for Asylum Seekers. Louise Newman is involved in advocacy for the human rights of asylum seekers and particularly for children affected by the policy of mandatory detention. Dr Sarah Mares, a child and family psychiatrist, is currently Head of Infancy and Early Childhood Studies at the NSW Institute of Psychiatry. She has a longstanding interest in human rights, child protection and the impact of trauma on development, and has been involved in advocacy for asylum seekers and refugees since 2001. Sarah is an experienced postgraduate educator, a member of NSW Medical Board's Health and Conduct programs, and co-author, with Louise Newman, of Clinical Skills in Infant Mental Health. Whether it was sending food, money, volunteer legal or medical work, or visiting distressed outsiders locked up, indefinitely, without charge, it's the inspirational story of a swelling grassroots movement. I suppose all of us wonder at some point what stuff we are made of. If really tested, how brave would we be, how principled, how selfless? Would we do the right thing or the easy thing? Would we have been collaborators in Nazi Europe, or resisters, for example; righteous gentiles who hid Jews, or part of the silent majority who turned their backs? In recent times we have had the chance to put ourselves to the test. And most of us proved to be indifferent bystanders. But some people took the honourable stand. These were the thousands of individuals who became grassroots advocates on behalf of the asylum seekers locked away in detention centres. 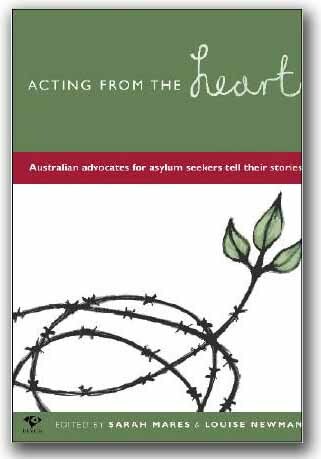 More than 50 of these ordinary Australians have written short accounts of how and why they became involved, and what they saw when they went behind the razor wire and high walls of Woomera, Curtin, Baxter, Villawood. Gathered in a new book called Acting from the Heart, the stories are humbling, enraging and uplifting, capturing a shameful period in Australian history. Thank goodness for Ngareta Rossell, Judy McLallen, Trish Highfield, Pamela Curr, Jon Jureidini, Michael Dudley, and the many other decent Australians who cared enough to act. These Australians went and saw for themselves, and have not been the same since. They got enmeshed in the lives of the individuals the Government portrayed as gold-diggers and queuejumpers. The advocates found bedraggled and desperate people slowly going mad behind the high walls. Over years, the advocates themselves became half-crazed, it seems, working day and night to help the people they visited. They pored over legal documents, sought out pro bono lawyers, lobbied politicians, harangued Immigration officials and racked up stupendous phone bills. In the process, they lost friends, alienated family members and lost patience with the trivia and minutia of daily life. The cause was so enormous, the silence so shameful, that once they had glimpsed the horror they could not cease or remain silent. The Government's policy of indefinite detention was designed to deter others, regardless of the human costs. Four thousand children were locked up, many for years, between 1992 and 2004, in order to punish parents for fleeing, and to act as a warning to others. The ends justified the means. But the means, as these witnesses testify, were appalling. Ngareta Rossell was asked to accompany a friend to Villawood in July 2001. She was curious. What she saw convinced her a great injustice was being perpetrated against a small group who had fled Saddam Hussein and the Taliban. That first day she saw a young boy who looked like "a fund-raiser for a famine in Africa". He was barely alive. The boy turned out to be six-year-old Shayan Badraie, whose story became well known after it was told on ABC television's Four Corners. After seeing him, shock turned to steely resolve, Rossell writes: "The iron had entered my soul." Another advocate, Judy McLallen, speaks of such a transformative moment after a conversation with Hassan: "I felt a bubbling rage that drove me." She was a Jew, and he an Arab. "It could have been me locked up in there. Sixty years ago it was me - 6 million of us..."
McLallen devoted virtually every hour, it seemed, for more than four years to getting Hassan out. Her family were "horrified, annoyed, irritated". She changed into a person she did not recognise - assured, confident, fearless, a networker, all in the cause of Hassan and the others. Trish Highfield, an early-child-care worker, became a tyrant of the telephone who for years rang John Howard's office, Philip Ruddock's office, Kim Beazley's. It was the children that drove her, "the poor little darlings" so frightened and bewildered, and who never seemed to grow. She took them treats and wondered if she was trying to buy forgiveness for the "sins of my country". And like the others who took the stories to the outside world, she could not forgive the indifference that greeted the telling. She confronted everyone who mattered. "They did nothing. They can never, ever say they didn't know. They did know - and they didn't care!" Psychiatrists went into the centres to do mental health assessments and emerged as advocates. Dr Jon Jureidini tells the story of a woman who had not spoken for two years, not walked for two months, screamed when people approached her. People told him he was brave to speak out. "It is not courage to take a stand," he writes, "more a reflex response to the stimulus of cruelty." Pamela Curr once had a tidy house and garden, and pride in being a sixth-generation Australian. She lost all that. But her long, tireless involvement with the refugees, and "the broad community of dissenters" filled her life with warm friendships and the "richness of human contact". The Australians gave years, blood, sweat, money and tears. At a pivotal time in Australian history, they were brave, principled and selfless. They passed the test.